To all Ambassadors for Peace, Friends and Contacts of the Universal Peace Federation in the UK we want to wish you a Happy New Year. Review of 2011 Link. We were happy that we could have a successful conference raising a number of prominent, current issues, 'Commemorating Human Rights Day 2012: How Far Have We Progressed?' This was the culmination of many other activities during the year. Looking forward to 2012 we forsee the events and activities that promote peace, development and humanity's role of one global family under an inclusive and loving God. Peter Graham opened the procedings with a rndering of the timeless Bob Marley classic "One World One Heart." A change of mood brought us some beautiful airs from Puccini (Mia Caro") and Tosca from Filimina. A Beatles revival followed led by the inimitable Bernard Chellew, with a voice that even Paul McArtney himself might be jealous of today. It didn't take more than a couple of choruses of "Can't Buy Me Love" to get the ladies up and dancing at the front of the hall. He certainly didn't need to buy them any diamond rings as an inducement. By the time Bernard and his crew got into their second number "Hard Day's Night" the men were up and dancing too, albeit with a little encouragement from the ladies. Hans Kampfman on piano added a nice bit of "Jools Holland" flavour to the mix adding an extra dimension to the interpretation of an all-time classic. Their performance was a sharp contrast in style to the offering of traditional Mongolian music which followed, presented by Choka who performed in a most exotic traditional costume. She performed two songs but sung with such velocity that it seemed it was over in a flash. After that was another sharp change of mood with some very mellow tones from the flute of David Rennie. His performance of Annie's Song was considered not enough to satiate the audience's appetite so he was summoned back for an encore. After that it was over to the audience to provide some more ad lib entertainment. The recognition of human rights theme of the day continued in the shape of some multicultural poetry recitations from a number of the participants. Restless Beings in a moving poetic rap style highlighted the suffering and injustice of the world. Heiner Handschin from Switzerland gave a rendering of some classic songs from West End shows, with his wife joining him on the stage for the "Over the Rainbow" finale. By popular request the meeting couldn't end without another Beatles performance. The strains of Hey Jude had everyone on their feet in a matter of seconds for a rousing final performance which left everyone wanting more in spite of the preceding long day of events. It is with great sadness that we saw the recent chaos and criminality on our streets of London and other major cities around the UK. Our condolences go out to the families of those who have lost their lives during the turmoil. Several images and statements are enduring. The first is the helplessness of an overstretched Police Force to prevent the sudden escalation of criminal behaviour, the emergence of undercurrents of jealously, greed, violence and inter-community tensions. When Police authority was removed real emotions and motivations were released in a crude and raw expression. 'You’re rich we're poor but we rule the streets tonight' was an expression of the crude, underlying feelings. In response many Londoners utilised social media for a good purpose to gather to clean the streets the next morning. There have been many noble but unsuccessful efforts to assist the vulnerable and deprived groups of UK society. It would be wrong to blame these riots upon these failures. We should instead recognise that there is a widespread failure to inculcate correct values that would strengthen the conscience of individuals. Irrespective of the opportunity to steal or loot individuals should not take the chance but respect other's property. Similarly Directors of companies should not abuse their position to exploit others. Politicians should not abuse their positions and power. Journalists, and religious leaders, also should not abuse their position. The Universal Peace Federaton believes we should live for the sake of others in creating one family of humankind under an inclusive, loving God and that we are morally accountable for our actions. These values should be taught primarily by example in the family, but also in schools, religious institutions and the wider community. If you wish to comment please see the weblog version. 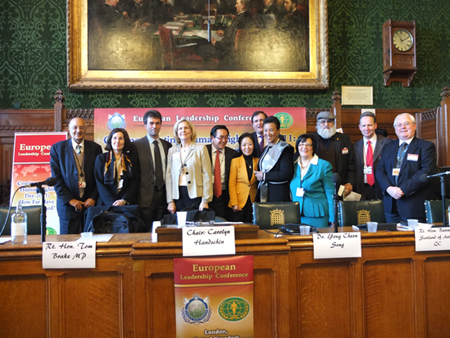 On 8th March the world celebrated the 100th International Women’s Day and on the 9th the Women’s Federation for World Peace (WFWP)-UK and the Universal Peace Federation (UPF)-UK jointly hosted an event to mark this auspicious day in the House of Lords. Speeches were given by various luminaries including Lords and Baronesses to a packed house with many people having to stand. Two of the speakers, Lady Fiona Hodgson and Baroness Sandip Verma, had recently attended the annual Commission on the Status of Women and the inauguration of the United Nation’s Women in New York. They were able to draw on those international developments in their speeches.